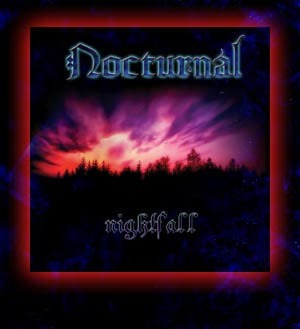 Nocturnal is a modern thrash band with three members, with stage names Vomitor, Evil Avenger and Hellbastard. They are some seriously killer thrash. The roots of NOCTURNAL go back into the year 1997 where a band called BESTIAL DESECRATION recorded their first demo. To make a long story short, BESTIAL DESECRATION split up in 2000 and the only founding member renamed the band into NOCTURNAL. The Aim was still like from the beginning to play Riff based old school Thrash in the vein of DESTRUCTION, ASSASSIN, LIVING DEATH, ONSLAUGHT, RAZOR, SODOM, IRON ANGEL,EXUMER, EXODUS and many more ! First release was the "Rites of the Black mass" Demo , after this In the end of 2000 Avenger met Skull Crusher who joined the band to play the 2nd guitar and to do the vocals ! With this 2 piece line-up the band recorded 4 tracks in the time from December ´00 to February ´01. 2 of the 4 songs were released on the „Slaughter Command" 7´EP on DEATHSTRIKE RECORDS ! In the middle of the year ´01 Metallic Mayhem (Vocals) and Hellbastard (drums) completed the band, with this we partned ways with Skull Crusher! It was not possible to rehearse with him as he lives too far away from the rest of the band and he starts to focus again more into his own Death Metal band, nowadays he plays with FLESHCRAWL ! With this 3 piece line up we recorded 5 tracks in November ´01 which was released as the „Thrash with the devil" MLP on DEATHSTRIKE RECORDS ! Also a Tapeversion was realeased by HADES PARADISE DISTRO from germany ! In the meantime the band found 2 new members in Jex (ex-VEXED) on the 2nd guitar and Vomitor on the bass ! In early April ´03 we entered the studio again to record another 7´EP called "Fire of Revenge" which got released after a bunch of delays one year later. In the meantime they partened ways with Jex because of several personal and some other problems. We now go on with only one guitar on live gigs with Avenger recording both guitars in the studio himself. Rehearsals are much more productive and effective again so they pretty fast completed the songs for their first album. The Band signed a 2 album deal with From Beyong Prod. (NL) and In June/July the band entered the Toxomusic Studio (Desaster, Metal Inquisitor, Metalucifer, Decayed) again for one week. The result was called "Arrival of the Carnivore" and the band hired Kris Verwimp for drawing them a fitting cover artwork. The album will be released in December 2004 and will hit you like a Razor ….